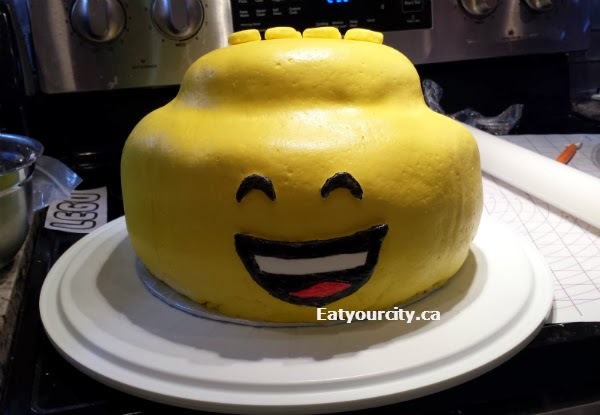 Eat Your City: Pineapple sheet cake recipe and tips for baking, making, buttercream and icing a fondant covered LEGO minifigure head cake from start to finish Part 1! Pineapple sheet cake recipe and tips for baking, making, buttercream and icing a fondant covered LEGO minifigure head cake from start to finish Part 1! Posted by My boyfriend adores pineapple. So a few months prior to his birthday, I thought, hey - lets make him a pineapple cake, maybe use some butter cream and then fondant the sucker to look like something nice (and hopefully not a ridiculously expensive mess!). So I started the hunt for sheet cakes or pound cakes that had pineapple in them.. something preferably light and fluffy with a good cake crumb, something that tasted good, and most importantly had both the physical properties of being dense enough to be stacked in multiple layers without collapsing or being carved, plus ability to stay moist for a few days. Well, there really isn't any sheet cakes out there period that have pineapple in it! Doh! So after lots of reading up on cake baking, 4 trial cakes later (the first one I discarded cuz it literally was a pound cake frisbee!) and plenty of mistakes and lessons learned... here's the recipe that fits the bill! There was a lot of conflicting info out there regarding do you or don't you do/not refrigerate/freeze fresh/iced/fondant'ed cake and in the next multi-part blog series, I'll let you know what really really does work vs what doesn't.. mainly cuz I used the trial cakes to test and air out most of the "tips" out there. The end result wasn't perfect since it was my first attempt, but if you have time to bake and experiment with trial cakes - I'd highly recommend it... or follow these tested tips in this series! First off, here's some tips when making any type of cake - if you're planning to use for an event like a birthday - heck, you're spending a lot of time and effort making the darn thing, here's some things to keep in mind so your cake turns out great! 2) If the recipe asks you to fold in ingredients - do so! This technique helps preserve the air incorporated into the batter.. if you beat the living bajeezus out of it, well, you may end up with a cake with huge air bubbles or worse, a deflated one with a sunken centre. 5) Use parchment paper to line the bottom and sides of the pan. 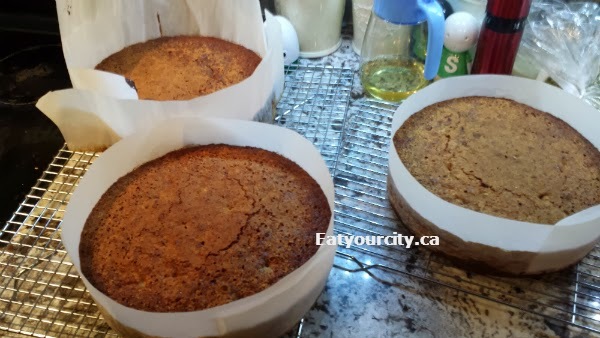 It makes it super easy to pop out the cakes without damaging them, and bonus if you're baking taller cakes - the batter will climb up the parchment papered sides to make a nice tall cake.. rather than muffin top over the sides of the pan. 6) Usually for round pans, double the baking time if you're using a long rectangular sheet cake pan recipe, as the batter usually works out to 2x "thicker" once you pour it in. 1) In or out of fridge? Freshly baked un-iced cakes: wrap in double layer of plastic wrap and keep in cool spot out of the sunlight. Popping it in the fridge will make any cake dry and hard as heck. The sugar in the cake will help preserve it and prevent bacterial growth. Freshly baked iced cakes: Icing such as ganache, buttercream have enough sugar in it, again, cakes can be stored out of sunlight in a cool spot. If you use icing or fillers such as dairy, cream, etc, then please do shove them in the fridge as they will go sour otherwise. 2) How soon can I wrap the baked cakes? Asap. Some bakers wrap it as soon as its cool enough to not burn themselves. Personally, I wait till its just warm to the touch and wrap it up - too hot and I find the exterior of the cakes may get a it "sticky-gummy" from the trapped moisture. I like my cakes moist, but not that moist! 3) Does it matter what temperature my cake is at when I ice it? Not really. I've tried icing a frozen and room temperature cake with buttercream and they both seemed to fare the same... other than the buttercream got substantially "thicker" on the frozen cakes as the cake transferred the coolness to the buttercream, so you have to be a bit quicker. 4) Use a cake leveller (they sometimes don't work super awesome with really dense cakes - go really really slow but for regular ones, they work like a charm!) to level and cut off the tops of your cakes. You can use the cake leveller to evenly cut a cake into neat layers as well. I used a Wilton cake leveller. Stay tuned for part 2.. icing! Pineapple cake all cool and ready to be frosted or stored until its time to cut and frost! 1) Preheat oven to 350F with the rack in the middle. Line either a 10inch round pan or 9x13 inch pan with parchment paper on the bottom and on the sides. The batter will climb up the sides as it bakes. 4) Cool on rack for 10minutes, then take out of pan and continue cooling on rack.